This synagogue is a temple. The definition of a temple is the flat area on the side of the head, in front of each ear. An example of the temple is the area to rub when someone has a tension headache. Temple is defined as a place where people worship. 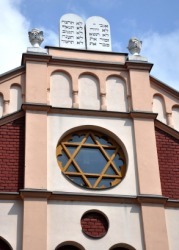 An example of a temple is a synagogue. "temple." YourDictionary, n.d. Web. 21 April 2019. <https://www.yourdictionary.com/Temple>. a. A building dedicated to religious ceremonies or worship. b. Temple Either of two successive buildings in ancient Jerusalem serving as the primary center for Jewish worship. c. Judaism A synagogue, especially of a Reform congregation. d. Mormon Church A building in which the sacred ordinances are administered. Something regarded as having within it a divine presence. A building used for meetings by any of several fraternal orders, such as the Freemasons. A building reserved for a highly valued function: the library, a temple of learning. Temple Either of two groups of buildings in London, the Inner Temple and the Middle Temple, that house two of the four Inns of Court and that occupy the site of a complex used by the medieval Knights Templars. Middle English from Old English tempel from Latin templum ; see tem- in Indo-European roots. The flat region on either side of the forehead. Either of the sidepieces of a frame for eyeglasses that extends along the temple and over the ear. A device in a loom that keeps the cloth stretched to the correct width during weaving. Middle English tempille from Old French temple possibly from Latin templum small piece of timber ; see tem- in Indo-European roots. The temple of Zeus was very large. (often capitalized) The Jewish temple of Jerusalem, first built by Solomon. Something regarded as holding religious presence. Something of importance; something attended to. Hands held together with forefingers outstretched and touching pad to pad, with the rest of the fingers clasped. To build a temple for; to appropriate a temple to. From Middle English temple, from Old English templ, from Latin templum (“shrine, temple, area for auspices"). (anatomy) The slightly flatter region, on either side of the head, back of the eye and forehead, above the zygomatic arch and in front of the ear. (ophthalmology) Either of the sidepieces on a set of spectacles, extending backwards from the hinge toward the ears and, usually, turning down around them. (weaving) A contrivance used in a loom for keeping the web stretched transversely. From Latin templum (“a small timber, a purlin"); compare templet and template.